We are having lunch with several of the grands, eating on plastic placemats that feature the United States presidents on one side and the three branches of government on the other. They are old placemats, as the last president shown is Clinton—and it is Bill, not Hillary. “Who is that one by Roosevelt?” one of the girls asks. The story that Taft got stuck in the tub is a slippery one. “That is Taft. 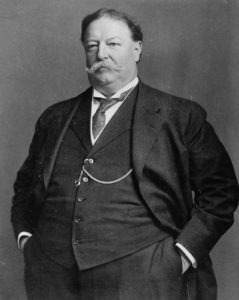 He was the heaviest President in history.” History with Grandma is fun because, one, Grandma is old enough she might actually have been there and, secondly, even if Grandma wasn’t there, she tells the story like she was. “The man weighed more than 300 pounds,” I say, as though I was there for the weigh-in. “I’d like to know more about Taft,” one says wryly, insinuating that my claim about Taft’s bulk warrants verification. “Grandma!” they shout in unison, as though I am telling such a whopper that lightning may strike. “I’d like to see the tub,” states the skeptic who will one day be a prosecuting attorney. 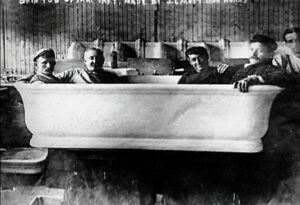 We look it up on the Internet and see that it was a tub specially built to hold four men and, in fact, four fully-clothed men are pictured sitting in the tub. They are quiet, mulling over the dilemma. How could one man get stuck in a tub, when they have seen as many as four of their little cousins fit in the tub at a time? “Did they have phones?” says the one, who at age 5 is the unofficial event planner in the group.